If you are a frequent visitor/purchaser of NMI’s online products, you may wish to create an account with us that stores data needed in the checkout page. Although it is not necessary, this feature will save you time if you wish to return to purchase additional items by eliminating the need for you to re-type your shipping and billing information. For your security we never make your personal information available to any other company or individual. Additionally, when checking out, your credit card number is not saved on our servers. We will never sell, trade, or grant any other use of your personal information except what is needed to complete your online transaction. Also, just because you’ve ordered from us, we don’t assume you want any future emails from us, so you won’t be bombarded with unsolicited mail. Returned goods: No returned merchandise can be accepted without a Return Merchandise Authorization number (RMA) from our Customer Service Department. This number must be obtained within 10 days of the invoice date. There is a minimum 20% restocking fee on all merchandise plus outbound freight. All returned merchandise must be new. Used, washed, abused or otherwise damaged merchandise will NOT be accepted. Custom orders requiring special set up will NOT be accepted for exchange or return. Warranty: All products carried in this catalog are covered with a 12-month warranty for material defects and workmanship. Prices: All prices are net prices in US dollars and subject to change without notice. They do not reflect shipping charges or taxes (when applicable). Because of the unforeseen rising cost of raw materials, pricing of some products may be adjusted at the time of invoicing. Damages or Shortages: All shortages or damaged goods must be reported to us within 10 days. Mark the Bill of Lading if cartons are damaged or shorted. Notify carrier, secure inspection report or file claim with carrier. We will assist you in filing a claim. Call our Customer Service Department. 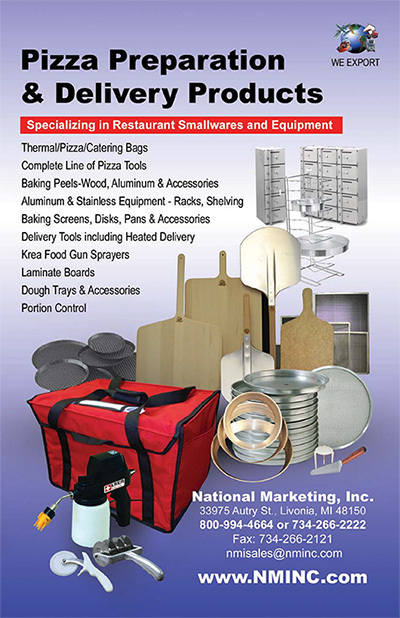 Packing: National Marketing, Inc. reserves the right to pack all merchandise in what it considers to be the most appropriate and economical manner. Special packing may require a surcharge. Returned Checks: There will be a $25.00 charge on all returned checks. Artwork: Submit camera-ready artwork for silk screening. Additional charges may be applied should artwork cleanup be necessary. We can accept files in Postscript, EPS, and Adobe Illustrator (through version 8.01). We can also accept files in TIFF and other formats, although additional charges may apply for scaling. Payment Terms: You may pay by credit card (VISA, MASTERCARD, or American Express), for non-first-time customers Collect on Delivery (COD) although UPS will NOT accept cash, or Net Terms with approved credit. We will accept COD check for first time customers, but only with a money order or cashier’s check. We also accept prepayments by approved Company Check or Money orders. For international orders, credit cards, prepayment drawn on US Banks, or wire transfers are accepted. Call our Customer Service Department for Wire Transfer Information.